The students, in addition to Becker, are: Edo Berger from Caltech; Steven Ball from New Mexico Tech in Socorro, NM; Melanie Clarke from Carleton College in Northfield, MN; Therese Fukuda from the University of Denver; Ian Hoffman from the University of New Mexico in Albuquerque; Richard Mellon from The Pennsylvania State University; Emmanuel Momjian from the University of Kentucky; Nathanial Murphy from Amherst College in Amherst, MA; Stacey Teng from the University of Maryland; Timothy Woodruff from Southwestern University in Georgetown, TX; Ashley Zauderer from Agnes Scott College in Decatur, GA; and Robert Zavala from New Mexico State University in Las Cruces, NM. Frail also is an author of the research paper, published in the March 15 edition of the scientific journal Nature. Berger, Hoffman, Momjian and Murphy are graduate students, and the rest were participants in the NSF-funded Research Experiences for Undergraduates program. The 14 students spent last summer working with NRAO scientists in Socorro. While each student had their own scientist-mentor, the VLA summer students also traditionally receive some VLA observing time for a collaborative project of their own. They sought ideas for their project from the NRAO staff, and, when they asked Frail, he suggested that they look at the latest research result from the recently-launched Chandra X-ray satellite. The students went to the Chandra World Wide Web site, and found that the satellite had detected an X-ray flare from the brown dwarf LP944-20. "We did some background reading, and realized that, based on predictions, the brown dwarf would be unobservable with the VLA, but we decided to try it anyway," said Berger. "Everybody we talked to said there was almost no chance that we'd see anything at all," said Becker. "They added, though, that it would be really exciting if we did," she said. 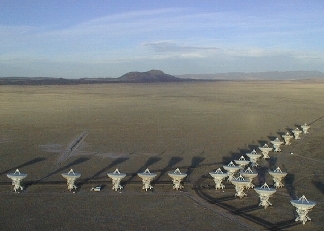 The students had been given three hours of VLA observing time for their project. They used an hour and a half of it on the brown dwarf. The day after their observation, the students gathered at the NRAO Array Operations Center in Socorro to process their data and make their images. Berger, who had experience processing VLA data, worked alone in the same room as the other students, who were working together on another computer. Berger finished first and was shocked at his image. "I saw a bright object at the exact position of the brown dwarf, and was pretty sure I had made a mistake," Berger said. He waited for the others, who were working under the guidance of another NRAO astronomer. Ten minutes later, their image appeared on the screen, also showing the bright object at the brown dwarf's location. "We all got excited," said Berger, who then began breaking the hour and a half's worth of data up into smaller slices of time. This showed that the brown dwarf's radio emission had risen to a strong peak, then weakened. That meant that the star had undergone a flare. "Then we got real excited," Berger said. They immediately sought and received more observing time, ultimately capturing two more flares. "They got very lucky," Frail said. "The thing flared during their observation. Other astronomers had looked for radio emission from brown dwarfs and not found any. This one flared at just the right time," Frail added. "It was just an incredible fluke that we found it," said Becker. The strong radio emission was unexpected because brown dwarfs, according to conventional theories, are not supposed to have magnetic fields strong enough to generate the radio emission. "The presumed internal structure of a brown dwarf will not permit a strong enough magnetic field," said Frail. "It looks like we're going to have to re-examine how we believe brown dwarfs work," he said. "The mere fact that they detected radio emission is remarkable," said Tim Bastian, an astronomer at the NRAO in Charlottesville, Virginia, who added that this object "will likely have something to teach us." "We're going to have to study this and other brown dwarfs more extensively with the VLA to answer the questions raised by our summer students' discovery," Frail said.